Commission: U.S. Must Make Nuclear Plants Safer In the aftermath of the disaster at the Fukushima Dai-ichi nuclear power plant, the U.S. Nuclear Regulatory Commission says American nuclear reactors need new safeguards to ensure that the kind of accident that damaged the Japanese reactors doesn't happen in the U.S.
A summary of the science of what's going on at the nuclear power reactors. America's nuclear reactors need new safeguards to ensure that the kind of accident that destroyed reactors in Japan last March doesn't happen here. That's the conclusion from a 90-day study of the accident undertaken by experts at the U.S. Nuclear Regulatory Commission. The Fukushima accident in Japan damaged or destroyed four reactors and spread radiation for miles around the plant, and it shook confidence in nuclear power around the world. Shortly afterward, a task force of engineers at the NRC got their marching orders: figure out how to keep this from happening in the U.S. The short-term review is done, and the task force has concluded that the government needs to redefine what a safe nuclear plant looks like, and then make it happen. 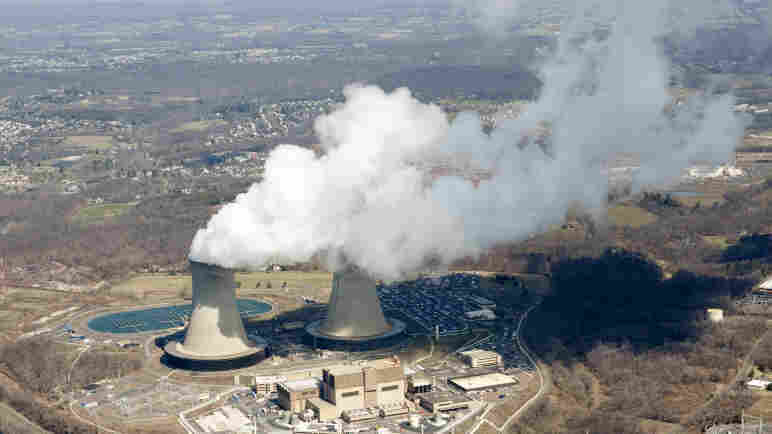 Nuclear Regulatory Commission Chairman Gregory Jaczko says in particular, U.S. plants need to be better prepared for what doomed the Japanese plants — the sudden and continuous loss of electric power for cooling pumps and equipment. "We want to be able to manage the situation in which you lose all electric power and to maintain safety systems and instrumentation and control systems for a much longer period of time than what our plants are designed for right now," Jaczko said in Washington this week. It was a freakishly huge earthquake followed by a tsunami 45 feet high that started the accident in Japan. That's not likely in the U.S., but at a hearing before the full nuclear commission Tuesday, task force leader Charles Miller said that doesn't really matter. "There are other ways that flooding can occur and you want to make sure regardless of the way that water gets in there, it's going to cause the same effect if your equipment is not protected against it," Miller told the commissioners. A 'Patchwork' Of Safety Regulations? Miller listed 12 ways to make American plants safer; they range from more flood, fire and earthquake protection to better training of operators. They also want more power and cooling backup to keep used fuel submerged in water during an accident. In addition, Miller called existing safety regulations "a patchwork." These rules accumulated over decades, partly in response to failures like the accident at Three Mile Island in Pennsylvania in 1979. Tony Pietrangelo, vice president of the industry's Nuclear Energy Institute, rejects the word "patchwork." He says reactor safety improved as experience with reactor technology grew. As for the new safety rules recommended by the task force, he says they're premature. "What impressed me about the report," he said, "is the lack of information that the agency had from Fukushima itself — in fact the report cites that they had either incomplete, unreliable or no information about some of the events there." Pietrangelo says the industry is already weighing how to deal with a Fukushima-style problem like the loss of electricity. He says the wake-up call came before the tsunami — it was on Sept. 11, when the threat of an airborne attack on a nuclear plant suddenly didn't seem so unreal. A critic of the nuclear industry, Christopher Paine with the environmental group Natural Resources Defense Council, says the recommendations are a good start, but long overdue. "On the whole, you know, nuclear power kind of faded into the background for two decades," he said. "And one of the things that everybody was doing was sort of taking the safety of the current plants more or less for granted." Adding new safety rules for reactors and used-fuel pools will cost money. Economist Kevin Book with ClearView Energy Partners says investors already are leery of the risk of backing construction of new power plants. "New nuclear power is an incredibly expensive bet," Book says, "and new nuclear power now hinges entirely on clear solutions to these expensive long-term storage and design questions." The NRC promised to put the most urgent recommendations into play within months and decide on further improvements within five years.